The Messenger Payments Dashboard displays a summary of current, archived, and draft activities in the system. 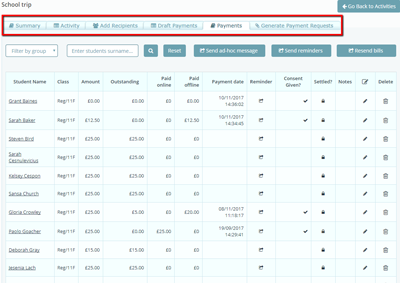 From View Activities you will be able to locate any activity, add additional students to an existing activity and view a summary of payments made for each activity so far. 1) To begin, click on View Activities under the Messenger Payments Tile. 2) From this page, you will see a list of activities with the relevant information separated by columns. Archive an activity when it is no longer active or needed, but you don’t want to delete it altogether. Use the toggle in the first column to archive an activity. If you want to view activities that have been archived, click Actions > Archived Activities. Archived activities can be un-archived by clicking on the toggle in the first column. To look for a specific activity, enter an activity name into the search box at the top of the page and click Find. To remove the search filter, click Actions from the top right corner and select Reset search. Sort activities by either alphabetical order or start time, by clicking on the column headers: Activity Name or Activity Date/Time. Users can view more information for an activity by clicking on the activity name from the first column. Further information for each activity are split into 5 panels: Summary, Activity, Add Recipients, Draft Payments, Payments, Generate Payment Requests. Student name Click on the column header to sort the student’s alphabetically. 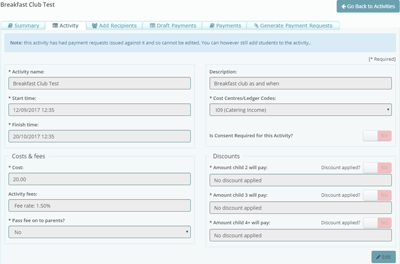 Click on the student’s name to view their Payment History, and issue refunds. Class Displays the student’s Registration Group. Amount due Cost of activity for this student. Amount outstanding Balance left to pay for this student. Amount paid online Amount paid via Messenger Payments’s system. Amount paid offline Amount paid via cash or cheque, and recorded in Messenger Payments. Payment Date Date last partial/full payment was received for this student. Reminder Click to send a reminder for payment home for this student. Consent Given? If consent is required, this column will appear with ticks next to students for whom parental consent has been received. Settled? Click the lock icon next to a student if you wish to remove the payment (settle the bill) for them. Notes/Edit Click the pencil icon next to a student to leave any notes. Your comment will then appear in the Notes column. Delete Click the bin icon to remove a student from the activity. This action will not be possible if the student has already paid for the activity. Other features that you will find useful on this tab are listed below. Click from the top of the page to send a group message to the primary contacts of students participating in this activity. Simply type your message in the textbox and send via the Actions panel on the right. The message will be sent out via Messenger and be viewable from your History page. 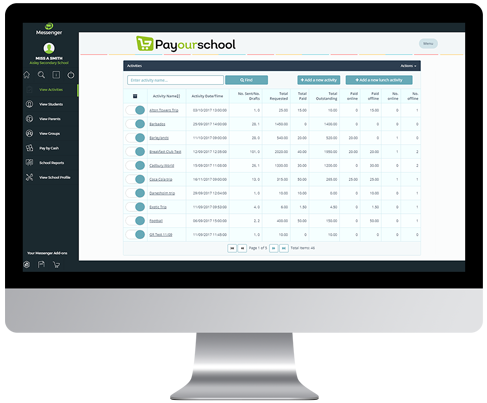 Click on a student’s name from the first column of the View Activities Dashboard to display their Payment History for this activity. From here, you can print off a receipt for proof of payment or provide a refund. To refund a payment, click the icon. From the Refund pop-up box, enter the correct information including why the payment is being refunded and the amount. Then click Refund/Cancel. Locate an individual student by entering their last name into the search box above the list of activities, then click Search. Clear the search results by clicking Reset. Click from the top of the page to send reminders home for all students that still have an outstanding balance. Click on from the bottom of the page to download a .csv of the Payment information for this activity. Ensure that you have enabled downloads in your internet browser. 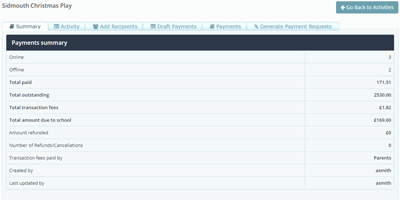 The Summary tab provides a high-level view of payments for the activity you are currently viewing. Important information on this page include how much has bee paid so far, and how much is still outstanding. 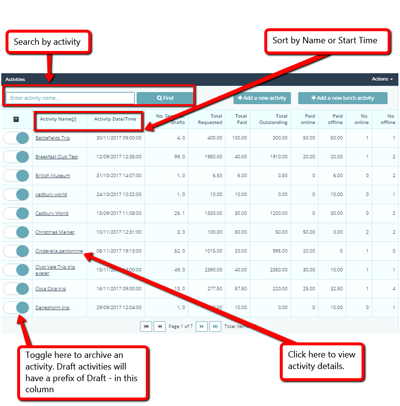 The Activity tab displays details including the description, time and date, costs and fees, and whether any discounts have been applied. Once an activity has been created and payment requests were sent (not a draft activity), the activity details cannot be edited. New students can be added to the activity after it has been created (refer to next section). To add additional students to an activity, click View and Edit. This will open the Activity in Edit Mode. Once you are in Edit Mode for an existing activity, you can add classes/groups, or individual students as outlined in the below image. 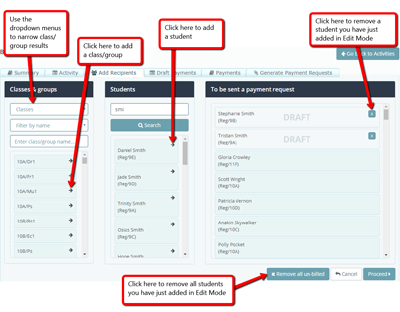 Once you have added additional students, click Proceed in the bottom right corner to update payment requests. For step-by-step instructions on how to add recipients, click here. Alternatively, click Apply Discounts from the top of the list if you would like to apply a new amount to all the new recipients. 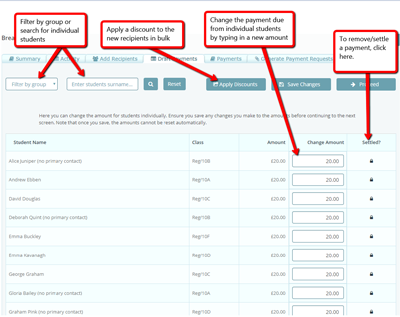 To remove a payment for a student completely, click on the icon in the Settled? column. 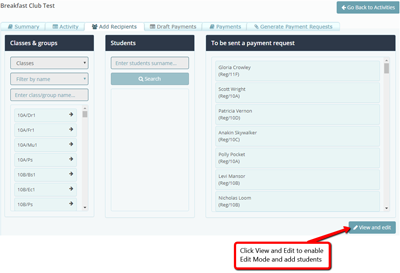 Click to issue payment requests from this tab if you have just added students to an existing activity. This button will be greyed out if you have not added any new students.